Are you in need of Antenna adapter that will help your antenna boost-up you signal? will help and assist your antenna to receive a crisp and clean reception for your car's AM/FM radio and HD Radio tuner. 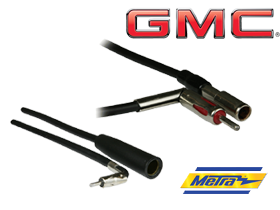 Metra Antenna Adapters are made from sturdy, dependable, and long lasting materials for a better sound output perfect for your GMC. We invite you to check our Metra Antenna Adapters and experience the true signal power you will never see in other brands!